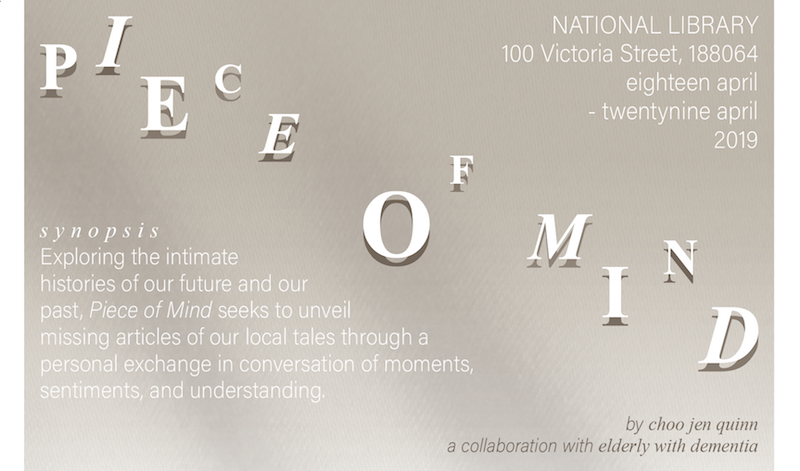 Piece of Mind presents the ache of longing, the open wound of loss, with the hope for togetherness through the stories and the histories that connect us all. Articulated through this optimism of a united people in our community, Piece of Mind pieces together the multitudes of voices and visions that often go unheard of in the daily commotion, that allows for a moment to soak in our surroundings, to appreciate the individuals we coexist with, and to strive for our great story as one people. Initiated at the National Library Building, the immersive installation wraps with panels of draped chiffon. These panels of printed and embroidered motifs formed by the unique stories of the elderly welcome visitors to participate in detailing their own anecdotes to continue the voice and the oneness of our community.